On a recent trip to New Zealand, where he was consulting with a major incubator called The Icehouse, Rob Adams decided to ditch his business suit for an afternoon -- and bungee jump off the Auckland Harbour Bridge. It’s just one of the many overseas adventures he’s had, including attending a Masai tribal wedding in Kenya, breaking an ankle on a volleyball court in Brazil, and finding himself at Bangkok’s airport in the middle of a military curfew. The serial entrepreneur and investor, who serves on the faculty at the University of Texas at Austin’s McCombs School of Business, spent several years as a kid living in Tokyo and fueled a lifelong zest for travel, which his international consulting practice provides plenty of today. In his role at UT, Adams oversees the Texas Venture Labs Investment Competition known as the "Super Bowl of investment competitions," now entering its 32nd year. He's hosted teams from India, Thailand, Chile, and beyond -- and working with them has only fueled his wanderlust. Over the past five years, he's touched down in Singapore, Kuala Lumpur, Auckland, Queenstown, Amsterdam, Kristiansand, Winnipeg, Oslo, and New York. On average, he clocks “easily 75,000 miles” a year. His packing philosophy, like many of our entrepreneurial road warriors: “If I’m traveling for a few days or a few weeks, I keep it minimalist -- both simple and light,” he says. Just days before he embarked on a motorcycle trip from his home in Austin to Sturgis, South Dakota, we caught up with Adams to take a look inside his well-worn bag. 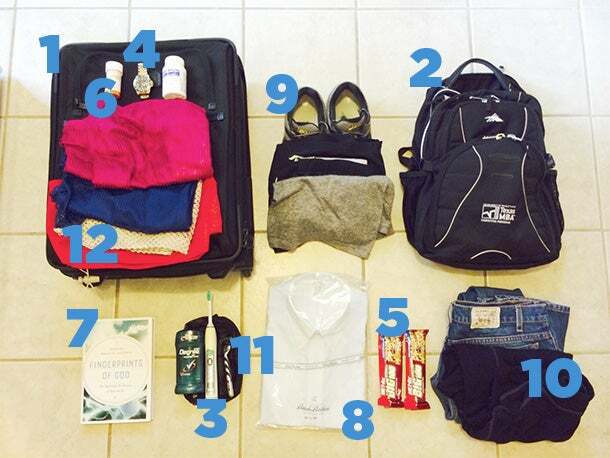 Here are the ways Rob Adams keeps his carry-on so light. 12. Mesh laundry bags. “These things make for the fastest and most-organized packing and unpacking you’ll do and take up no space. I bring four, each a different color, everywhere I go -- one with underwear, one street clothes, one gym stuff, and one dirty clothes. Easy to pack and unpack multiple times and you always know where everything is in a hurry."